Warm, crazy, and hazy delays from the most popular tape echo ever made. 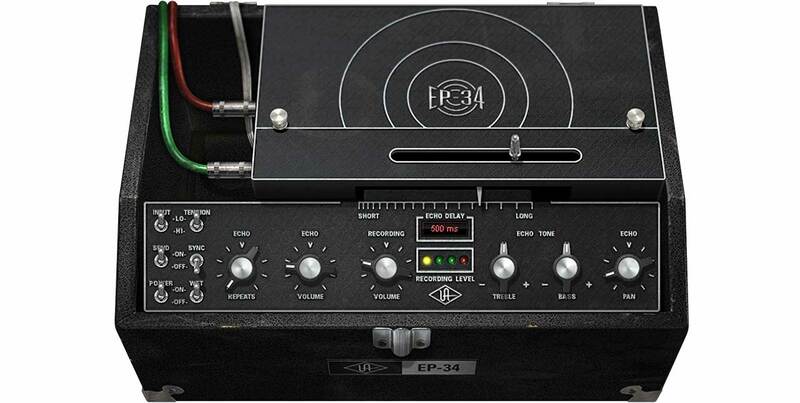 The EP-34 Tape Echo plug-in for UAD-2 hardware and Apollo interfaces gives you an exacting emulation of the legendary tape echo device used by Jimmy Page, Brian May, Chick Corea, Eddie Van Halen, Eric Johnson, and Andy Summers. Vintage Echoplexes are legendary for their idiosyncrasies — including distortion, wow and flutter, self-oscillation, squelch effects, and other random analog goodness. The EP-34 Tape Echo plug-in emulates all of this, and more. Like the hardware, the EP-34 plug-in’s record head can be slid in real time for smeary weirdness, trippy dub excursions, and more. The musical input clipping of the original hardware’s hallowed preamp section is also captured via a Record Volume control, giving the EP-34 some subtle to not-so-subtle tonal coloring and distortion. With the addition of modern workflow enhancements like Tempo Sync, the EP-34 Tape Echo plug-in is must-have tool for any mixer. 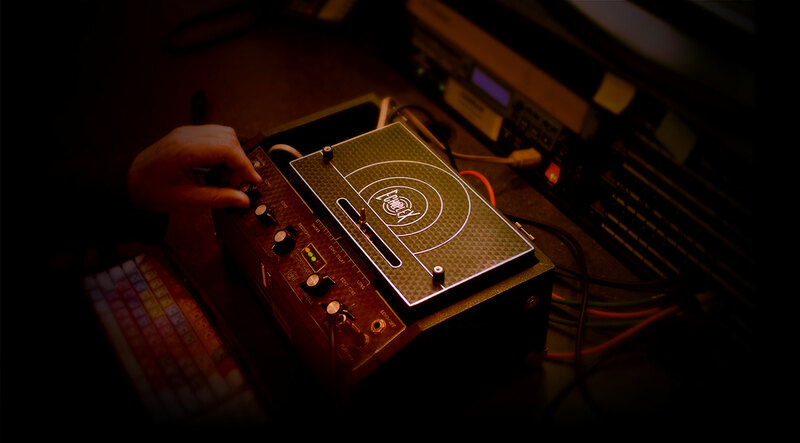 The EP-34 Tape Echo is not affiliated with, sponsored, nor endorsed by any companies currently using the "Echoplex" name. “Echoplex” “EP-3” and “EP-4” model names, are used solely to identify the hardware emulated by Universal Audio. What can I say that hasn't been said? Very cool on guitars & vocals! I have a real one, this one sounds just like it without the maintenance factor. My buddy is an EP geek/nerd/snob and thinks this thing sounds f-n great. Me too. It sounds really great. It's amazing how you can give a delay so many knobs and options, and it makes it so much harder to get "the sound". These simple controls make it easy to dial in what you're looking for. Also, definitely watch the UA video about it. Some great tips and tricks. I love using this on almost every mix I do. It's got a great sound, and if you really drive it with a very short delay time and low feedback then is gives great characterful space to vocals without being obvious. Excellent value for the price! I love this delay. The sound is amazing and for me, I find it to inspire creativity. For a demo, you can see a youtube dub tutorial where I demonstrate this plugin in action. I would not have this as my only delay. The cooper time cube is way easier for me to get clean measured delays on vocal and drum tracks. But it sounds great and is fun! Sounds very analog & adds a cool sonic texture I haven't found with other delay plugins. It's good to have on hand when you want to add some unique character to an instrument or vocal track. Sounds like the real deal! Couldn't be more pleased - it responds and sounds like the real deal, with all it's features and quirks. I've been using it to liven up my guitar tracks. The stereo spread is just incredible, but it also sounds fantastic and punchy as a mono instance. It's really impossible to go into all the detail of this sound.. but it really brings the source to life with depth and movement. I can't wait to try this on vocals! Keyboardist, Guitarist, Producer, the band "Spain"
I totally love this plug-in. Nice, dirty and gritty. This plug- has the feel and sound that i love. What a stunning device this really is... Its warmth and versatility are like no other and uncomparable with any other delay device..! Combine more than one and the result is beyond this word..!!!!! Perfectly done once again UAD...! Well for years I was looking for an authentic, noticable but not too flashy reverb, mainly for the use on vocal tracks. I've tested alot of plugins and I ended up using some Lexicon stuff, which is really good too. Then some lucky day, I've bought my first UAD card and tried this echo plug-in. Since I own it, I use it in nearly every track to open up and widening my vocal-tracks. From time to time I use it on acoustic guitars too...it's very nice sounding for both. It doesn't change the natural sound of your material but it prescinds the nicest nuances out of it. I can absolutely recommend this plug-in for nice reverb and delay programs! I love messing with speed control on they delay. Automating it is such a cool effect. I was lookin' for something to tuck under vocals, drums, and guitars without being heavy just enough to add to the groove. I'm glad I purchased thiis, now I'm experimenting with delay more. Another great weapon added to my arsonal. Great sounding delay, and tons of fun! Very inspiring to work with! Put off buying this one for a long time, but finally caved. This thing is all character, from the drive and saturation to the echoes themselves. It all sounds so real! Of course you can use this effect to do crazy stuff, but you don't have to at all. It's great just bubbling along in a mix on a much more tame setting. Use this if you don't want to sound like software. great effect for electric guitar, for example. Lovely little plug-in. I'm a dub producer and this hits the spot! Imparts a warmth and subtle character to the sound. Will use again & again. When my demo ran out I figured I'd just go back to my other delay plugs... Nope! I really missed this one immediately. The EP-34 just always sounds right to me - warm and beautiful and real... great compliment to the wilder and brighter sounding RE-201. Excellent software, like i expected. With the wet button, when you print your audio and move it ahead according to the delay time , you've got a great tape sound without delay at no more expense. The only drawback is the maximum delay time of 700ms. That's a 1/2 at 67bpm. I thought software could beat the hardware on this. Too bad, but not enough to ruin the pleasure and true character it adds to your music. this ep-34 tape echo is one of the finest plug ins I have ever used since it is a multi use item with excellent echo ,delay and added effects characteristics beyond any expectations .any sounds can be enhanced both dramatically or with great finesse . the ease of operating scope is another example of the uad perfection . Vintage. Warm. Control. Historic. Mine! I love delay. At times (especially for vocals) I will use it like a separate backing instrument. I'm shocked at how versatile, complimentary and modern this effect can be although there is plenty of old school "cheese" if one wants it.